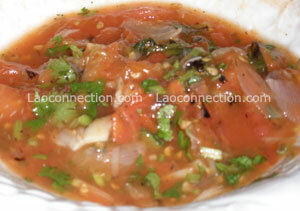 What you might not know is that a jaew (sauce) is as essential to a Lao meal as sticky rice is, believe it or not! One of my faves is jaew mak lin. Here's our quick and easy recipe that'll take you just under 15 minutes to make. Cut the schallots, garlic, green onions in half. Now take those ingredients along with the hot peppers and flame char and cook them (or pan fry dry with no oil) for approximate 5 minutes or more. Cook until they're slightly blackened/charred. Bring out that pestle and mortar. Add your charred ingedients and mash them up real good. Then add the tomatoes and mix it all up together. Now for seasoning, add the salt, sugar, and fish sauce. Vary it to your taste. Final touch: Chop up some fresh cilantro and add it in and mix it some more. Done (see below). Note: Traditionally this recipe is done with charring the vegetable ingredients over an open flame. But if you don't have that option, just use what you have like we did. What is a jaew? Jaews are used for either dipping sticky rice or other food into or you can add a bit of it to whatever you're eating to give it an extra kick of flavor or spiciness. This particular recipe resembles what some might call a salsa. This dipping sauce looks delicious. I came to your site looking for a dipping sauce which also starts with jaew, but I believe is called jaew som. 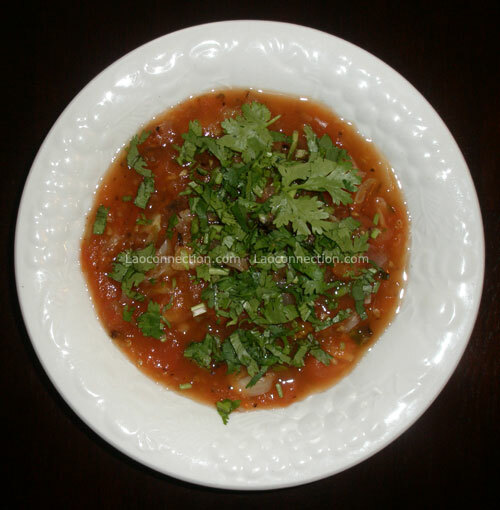 It has more of a broth type texture and is full of flavor and can be a bit hot (spicy-wise). I believe it has fish sauce, broth and peppers for sure, but don't know anything else. We had it at a Thai restaurant but were told it was a laos dish. It was served with sticky rice. They also said, like you mentioned about the Jaew Mak Lin sauce, that it was an essential part of the daily meal and served with sticky rice. I would appreciate any help you can give me in finding the recipe for this jaew som dipping sauce. It's one of the best things I've ever eaten!!! Thank you! Hi there. Glad you enjoy jaews! The recipe for jaew som is actually quite simple. You'll need a pestle and mortar to mash everything up together. Ingredients: 1 clove of garlic (peeled), 1-2 small chili peppers (lightly chopped), 2-3 tablespoons of fish sauce, 1 teaspoon of lime juice, 1/4 teaspoon of sugar (optional), and top off chopped coriander/cilantro. With all the aforementioned ingredients, mash up the non-liquid ingredients in the pestle and mortar, then add the liquid ones and mash up and mix it all up. Adjust flavor to your liking. Hope that helps. Enjoy! It's all good but step #5 needs some serious tweaking. There is an important order and technique of using the mortar and pestle that creates the flavour of this dish that needs to be explained. You won't get it if you just "mash them real good". Specifically you need to explain how the salt is used as an abrasive at the beginning to make the a paste. That is the secret to giving this dish it's penetrating flavour.